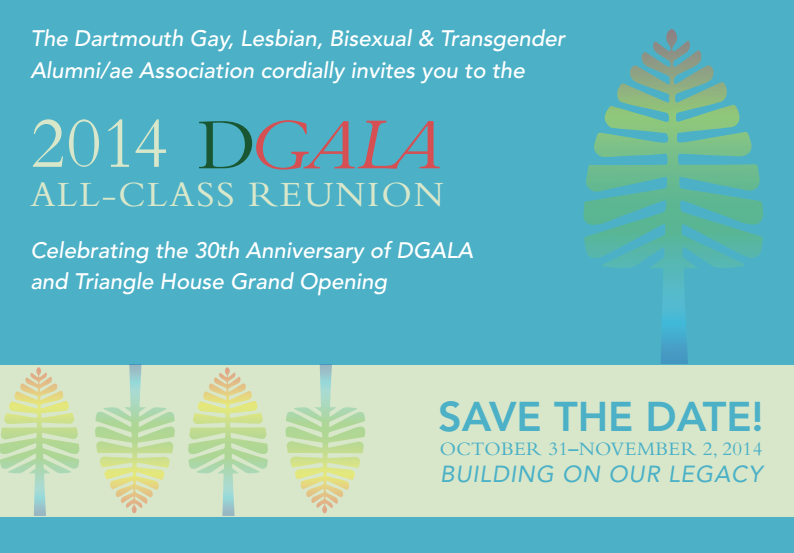 DGALA turns 30 this year and we hope that you will celebrate this tremendous milestone with us in Hanover. Please mark your calendars and make plans to join us! Drawing nearly two hundred alumni back to Hanover, our ’09 Reunion included three days of events, panels, dinners, mixers, and special events, and we look forward to exceeding expectations again this year. Stay tuned for frequent updates to this site as our 2014 Reunion programming takes shape! Rooms at our negotiated rates are still available at the Marriott Courtyard — just mention “DGALA” when you book to take advantage of this reduced pricing. We are actively committed to welcoming as many alums back to campus as possible. Thanks to the support of our 2014 sponsors, we are proud that the 2014 reunion registration costs are lower than they were for the 2009 reunion (list updated through March 2014). Please consider being a 2014 reunion sponsor. Your early sponsorship will also help ensure that 2014 is the most fabulous reunion yet!